This post has been re-posted from the Utah Museum of Fine Arts blog, and was written by UMFA intern Courtney-Rae Reinecke. It reports on an event that I had the chance to work on with the museum, as well as many other partners, back in May. Enjoy! 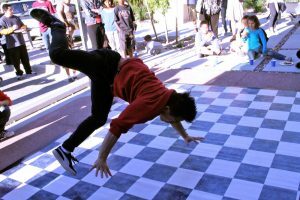 Outside the Glendale Branch of the Salt Lake City Public Library, break dancing erupted when DJ Dynamic started busting out the beats. 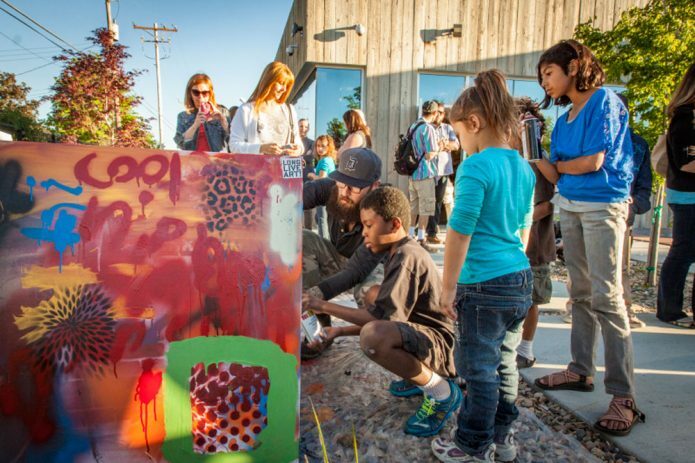 Onlookers ate pizza and enjoyed the dancing and music, while artist Zach Franzoni from Mestizo Institute of Culture and Arts prepped canvases for a collaborative graffiti session. 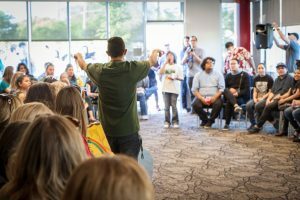 As the crowd swelled (ultimately to some 200 people), so did the excitement for what this May 11 ACME Session hosted by the Utah Museum of Fine Arts—“What’s Hip Hop Got to Do with Education?”—had in store. ACME (Art. Community. Museum. Education.) is the UMFA’s outreach initiative dedicated to rethinking the public role of the museum. These bimonthly ACME Sessions bring together Salt Lake City’s most creative, inventive, and cross-disciplinary minds—K–12 educators, artists, museum professionals, university faculty and students, engineers, scientists, technologists, activists, researchers, and others. May’s session was designed to demonstrate the value of hip-hop as a relevant educational vehicle. Jarred Martinez and Saia Langi from Truth Cypher, a Salt Lake-based community of writers, storytellers, and spoken word artists, started the session with a poem. They talked about the importance of school but also how hip-hop can help teachers connect with their students in more meaningful ways. Jorge Rojas, UMFA director of education and engagement, gave a bilingual rundown of the ACME initiative. Paul Kuttner, the University Neighborhood Partners’ Education Pathways Partnership manager, explained that this session was designed to recognize hip-hop culture’s approach to learning and how to use it to transform traditional schooling methods to better serve our diverse youth. 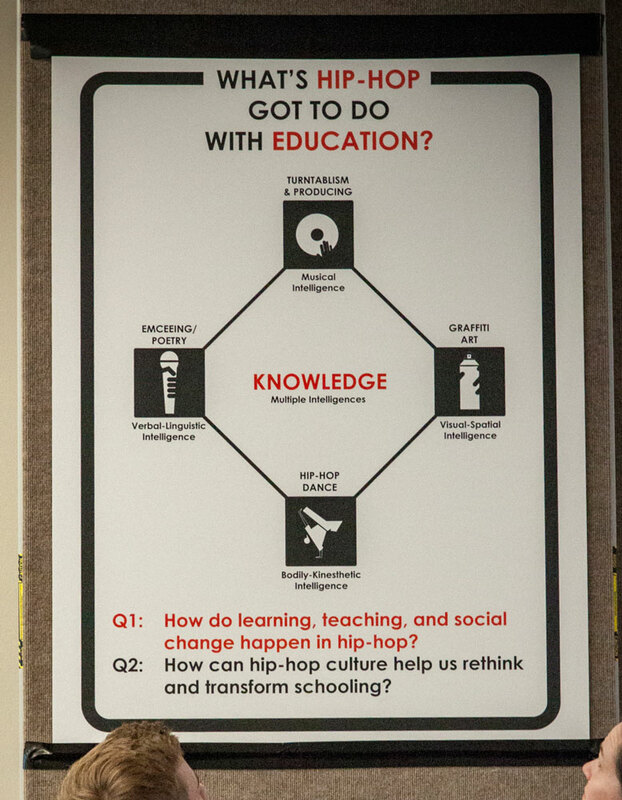 Kuttner turned the audience’s attention to a poster that explained the original four “elements” of hip-hop, each of which line up with a different kind of “intelligence,” as proposed by Harvard University professor Howard Gardener’s theory of multiple intelligences. Graffiti Art—Visual-Spatial Intelligence led by Franzoni. After two rounds in which all participants discussed both questions, everyone joined together in a cypher of chairs to conclude the evening. A hip-hop cypher is a space for dancers or emcees to create room for each other to have their time and then step back so someone else can have their time, a place for listening and building off what others have to say. In this cypher, participants explained what they did and what they learned, sparking a discussion among the educators, parents, and students who gathered. All expressed their wishes to integrate what they learned in the Acme Session into traditional schooling. 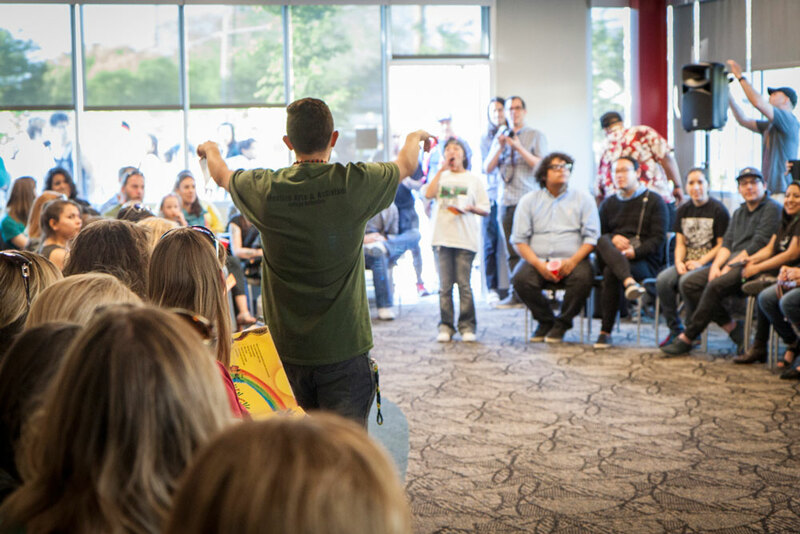 Because of the excitement triggered by this ACME Session’s enthusiastic turnout, session leaders proposed a follow-up meeting to maintain the momentum, from bringing together a larger “think tank” in the Salt Lake City area to creating workshops for educators and artists. Stay tuned for more upcoming events! P.S. 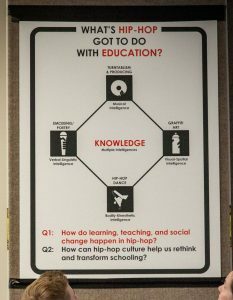 Here’s a list of resources compiled by the session leaders that you can use to explore how to integrate hip-hop into your own curriculum and classrooms!